I can haz parent conferencez? 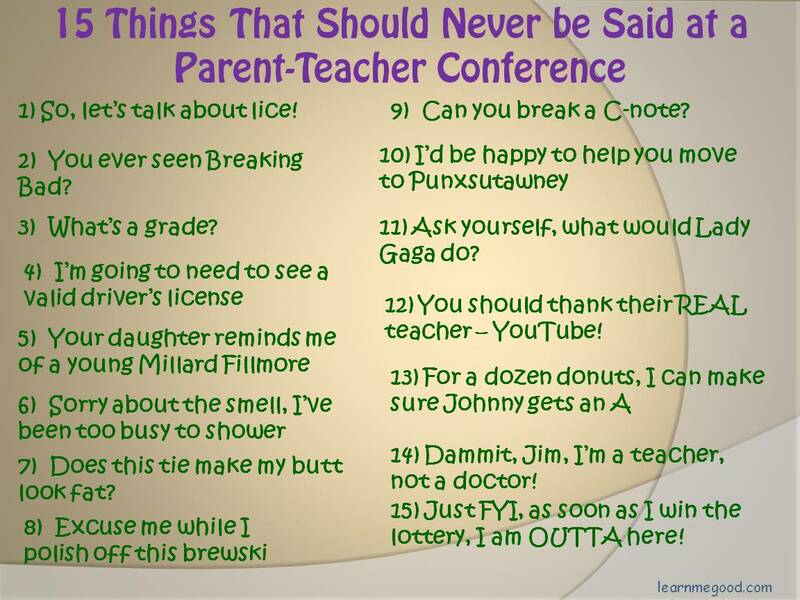 Tonight is that happy happy joy joy of nights once again -- Parent-Teacher Conference night. 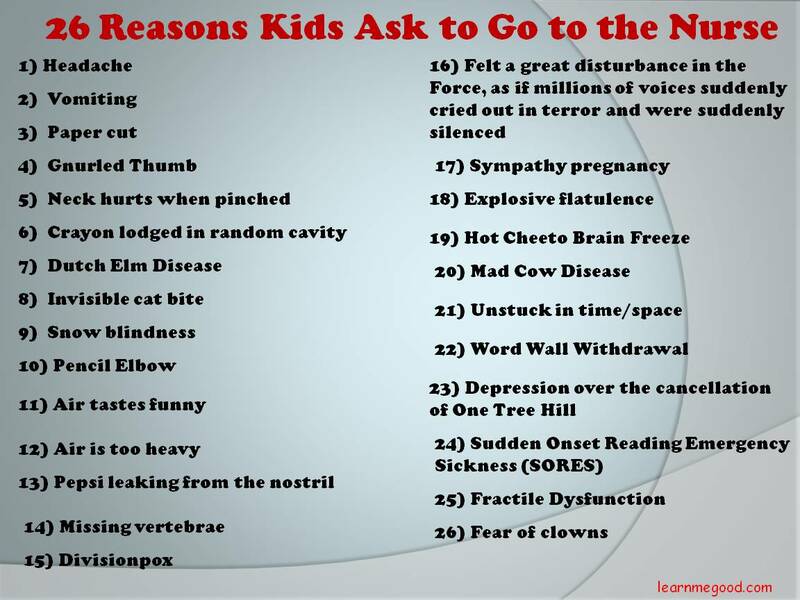 Here are a few things I will definitely NOT be uttering. A sense of what now? For the past two weeks, we've been hearing a lot about "a sense of urgency" at school. Mostly how our principal doesn't think we have one. And how her higher-ups don't think we have one. I wonder how exactly a sense of urgency is measured. I haven't seen any kind of barometer on the wall (Urgency Level Purple today! ), nor do I get updates on my smartphone. Is someone who is running up and down the rows of desks (with or without scissors), sweating profusely, eyes bulging, yelling basic factoids at the their kids demonstrating a sense of urgency, while someone enjoying an even-paced lesson while smiling at their kids dropping the urgency ball? These are things I'd love to know as I'm being told I don't have a sense of urgency. The best guess I can come up with from what has been going on is that a teacher's true sense of urgency can only be reflected in how well their students do on tests. That somehow if a teacher has a sense of urgency, he/she can transfer that urgency over to the student who will then feel compelled to score higher. I know for a fact that I have a strong sense of urgency about wanting and needing my kids to do better. Not just on tests, but in life in general. But I will admit I've been somewhat deficient in transferring that sense of urgency over to most of my kids. It's a very hard thing to transfer, because it's not like an auto title that one can just sign over to someone else. I've tried direct skin-to-skin transfer -- but high fives and fist bumps seem to only make the kids happy instead of stressing them out more. I've tried Vulcan mind melds -- but thoughts of Hot Cheetos and Justin Beiber have forced my mind back like a brick wall. I've tried lecturing, but judging by the quickness of eyes glazing over, it's obvious my sense of urgency just didn't take. So I continue to be one of those teachers who is labeled with the USN (No Sense of Urgency) stamp. I guess until I can think of something else to try, I'll just have to continue instructing the kids and building up their math skills as best as I can. Let's face it. Sometimes kids get distracted. It doesn't always take much. 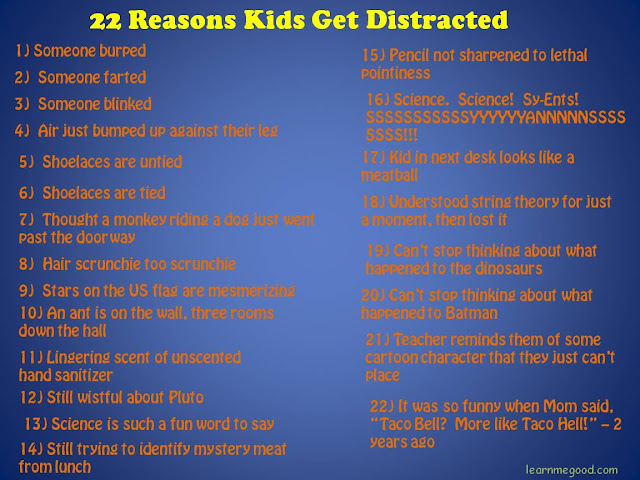 Here are just a few reasons kids may get distracted in class. While everyone is coming clean, I have a confession to make. I too once used a banned substance to enhance my teaching performance. The hardest part was finding a fellow teacher to actually administer the shot into my buttocks. 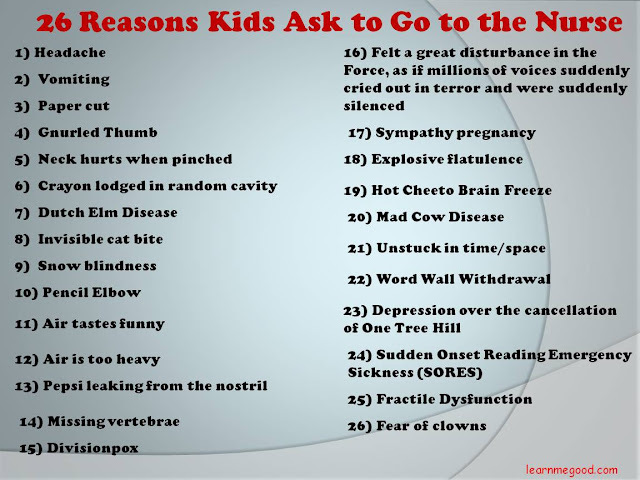 Having a little fun today, I thought I'd list a few reasons that kids may ask to go to the nurse. Then I turned it into this graphic. Free on the Kindle today and tomorrow! 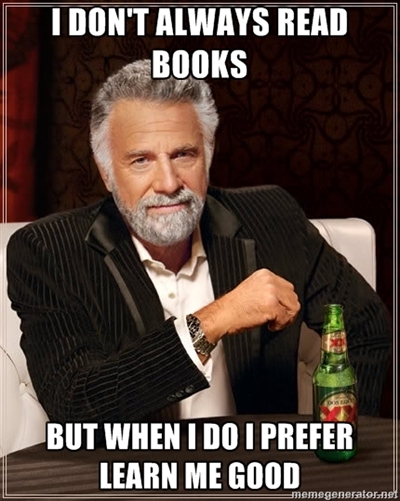 The Kindle version of my first book, Learn Me Good, is free today and tomorrow (Jan 9 and 10). If you haven't ever checked it out, I hope you will do so now, and if you already have, I hope you will pass the news on to friends and family. Now that we are in a new year, I'd like to once again extend an invitation to anyone who is interested to join the Learn Me Good mailing list! Every once in a while, I send out emails with ideas for promotion of the book, questions for suggestions, and giveaways. If you're interested, please drop me an email -- learnmegood2@yahoo.com (note the 2) -- and let me know you're in! May your 2013 be full of excellent observations, inquisitive students, and dry erase markers that never run out!